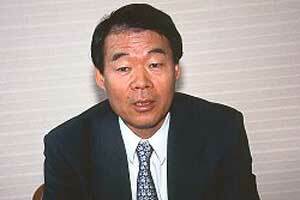 Kazuo Okamoto is a big cheese in the Toyota Motor Corporation. At 62 he is the head of the company's Research and Development and an executive vice-president and member of the board. He is coming up to 40 years of service with the company. One of Okamoto's responsibilities is motorsport and he is the man who makes the hard decisions about the Formula 1 programme. Panasonic Toyota Racing has been in F1 for five years. Toyota has invested a huge sum of money in the team but it has not achieved as much as was expected. How long can that situation go on? "Of course I have to admit that the actual track performance is somewhat less than what we had anticipated and what we hoped for," Okamoto admits, "but when we talk about money, we are not throwing our money around. We are rather tight about budgets and, in the meantime, we feel that through the five years in F1 we have gained a lot of fans who are supporting us. Their presence is very important for us. Can I allow this kind of record to continue? Probably no." There is now a lot of talk about an engine supply deal with Williams so that Toyota can have a second team that is much more competitive. "There is no denying that we are in negotiation with Williams about engine supply, but it is also a fact that there is still no decision and no agreement about that. The more rivals we have, the better. But of course that is provided that we are able to make the extra effort." And what about the branding of such engines. Does it make sense to have Toyota racing against Lexus, another Toyota brand? "I am aware that rumours abound in the press about the naming of the engines but because we still have not achieved the decision or the agreement, it is premature to think of the naming just yet." Toyota has long worked with a philosophy of what in Japan is called kaizen, which is translated as "continuous improvement". The philosophy means that Toyota works constantly until a goal is achieved, learning from its mistakes as it goes and making changes and then examining results before moving onward and upward. Formula 1 has a much more aggressive attitude, typified in recent times by Mike Gascoyne's style of management. Gascoyne helped to move Toyota forward but he has now been dropped. Is Okamoto worried that the culture of Toyota may not work in Formula 1? "There is no denying the huge contribution that Mike brought to the team," he says, "particularly the podiums last year but looking towards the future our aim is for everyone to get together to support Formula 1 victory and to share in that victory and if that is our purpose we have to say that the organisation we have now compared to that which we had during Mike's tenure is something that TMG decided is better." But what about the philosophy? "When a car company has to make big decisions each company has a different way of arriving at that decision. We all do things differently. I think the same thing applies to Formula 1. There can be many ways to a victory and there can be new ways of approaching it, so we are not too worried that departing from conventional thinking is a threat to us." When Toyota went into Champ Cars in 1996 with Dan Gurney's All American Racers the team had big ambitions but failed to score any decent results and at the end of 1999 - after four years of trying - Toyota axed the programme and did a deal with Target Chip Ganassi Racing in order to win. That decision resulted in victory in the Indianapolis 500 in 2000. Is Toyota flexible enough to do the same sort of thing in F1? "I hope that the change in the organisation that we underwent recently is proof of such flexibility," Okamoto says. In Formula 1 circles the Toyota drivers are seen to be inconsistent. What does Okamoto think? "Do you have any suggestions?" he says. "Who are the best drivers that we should be looking at? I think we have great drivers." Toyota has also invested in winning the Japanese Grand Prix away from Honda in 2007. The race will move to Toyota's circuit at Mount Fuji. Is that something that is important to Toyota in Japan? What is the logic of the deal? "I think you are right in saying that the immediate benefit will be in Japan," Okamoto says. "But it is very important for us that we are able to hold a Grand Prix at Fuji Speedway. We absolutely have to make this Grand Prix a success. Mount Fuji is a 100% subsidiary of Toyota but the actual operation is made by the management of Fuji in an autonomous manner. Toyota will support that. In the case of Suzuka the local municipality is throwing in their support in a big way and I hope that a similar thing can happen with the Fuji area." Do you consider the F1 programme to have been a success? "The fact that we embarked on F1 was the right decision," says Okamoto. "Whether we are having success in terms of track performance I cannot say we are succeeding."